James is originally from Eau Clare, WI and is a graduate of North Central University. James was licensed in the Assemblies of God in 2007 and ordained in 2009. 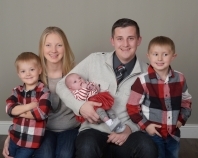 Prior to serving at VCC James was the youth and young adults pastor at New Life Community in Maple Grove for 8 years. James and his family came to Spring Valley to be the lead pastor of VCC in June 2014. James and his wife Emily have 3 Children two boys and a little girl.